This bright blue card boldly showcases DSC’s brand and brings in scholarship dollars with every purchase you make - that means a painless and ongoing gift to DSC students. You can request the new card to replace your old card and keep the same number. To apply for your Falcon MasterCard click the link below or call us at (386) 506-3665. An offer for all members! You can now use your points for airfare, lodging, and brand name merchandise. There’s no annual fee and rates start as low as 8.88%. The same low rates apply for cash advances as purchases, immediate increases in your credit line, and one day service on replacement cards (certain fees apply). You can also get your account information online at ezcardinfo.com. Now your ATM card can work like a check! This card adds the buying power of the MasterCard to your ATM card, so you’ll be able to use it instead of a check anywhere MasterCard is accepted. It’s easy, convenient, and welcome. 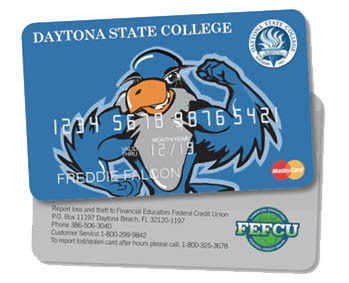 To apply for your Falcon MasterMoney Debit Card, stop by the credit union on DSC’s Daytona Beach campus in Building 300, Room 122. Please Note: you must have a FEFCU checking account to take advantage of this card..
ATM cards can be used to access your savings and your checking accounts at many convenient locations nationwide. However, they can’t access the Money Management Account. To apply for your ATM Card, stop by the credit union on DSC’s Daytona Beach campus in Building 300, Room 122. Please Note: deposits are only accepted at the on campus ATM and CU 24 machines. The convenient choice for busy shoppers and the perfect gift for all ages. They’re safer than cash, easy to use, and can be used anywhere Visa® debit cards are accepted. To purchase a Gift Card, stop by the credit union on DSC’s Daytona Beach campus in Building 300, Room 122. The perfect choice for travelers or others wanting the convenience of cash without the risk. VISA Travel Cards are accepted anywhere VISA is accepted, and can be reloaded remotely. These cards are a great alternative for anyone wanting to avoid the inconvenience of Debit Card fraud. To purchase a VISA Travel Card, stop by the Credit Union on DSC’s Daytona Beach Campus in Building 300 Room 122.